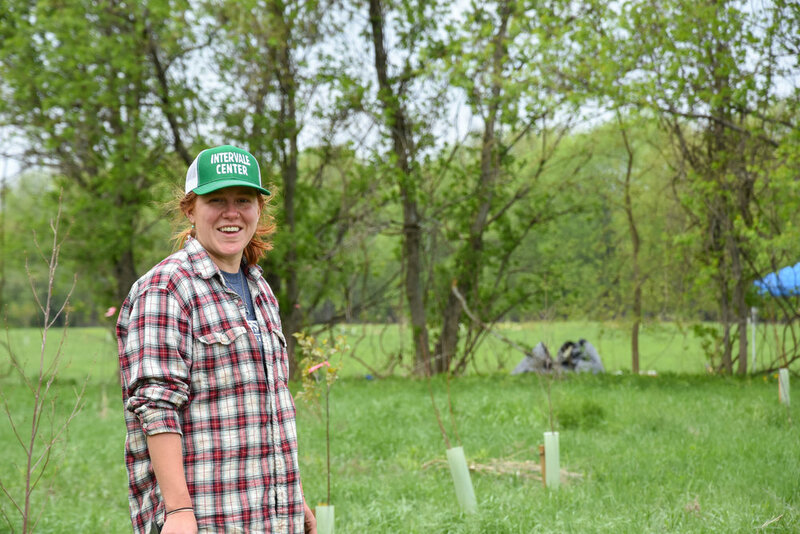 As a field technician at the Intervale Conservation Nursery (ICN), Mandy spends her days working with trees and feeling generally stoked about the power of strong, healthy forests. She has long held an interest in climate change and the ways that humans interact with the natural world. These interests led her to the Rubenstein School of Environment and Natural Resources at UVM, where she graduated with a Bachelor of Science in Environmental Studies. During her time at UVM, she was a work-study student, intern, part time field tech, and planting crew member at the ICN and worked closely with Mike Ingalls and Seth Gillim. After graduation, she worked various jobs in Boston and California. 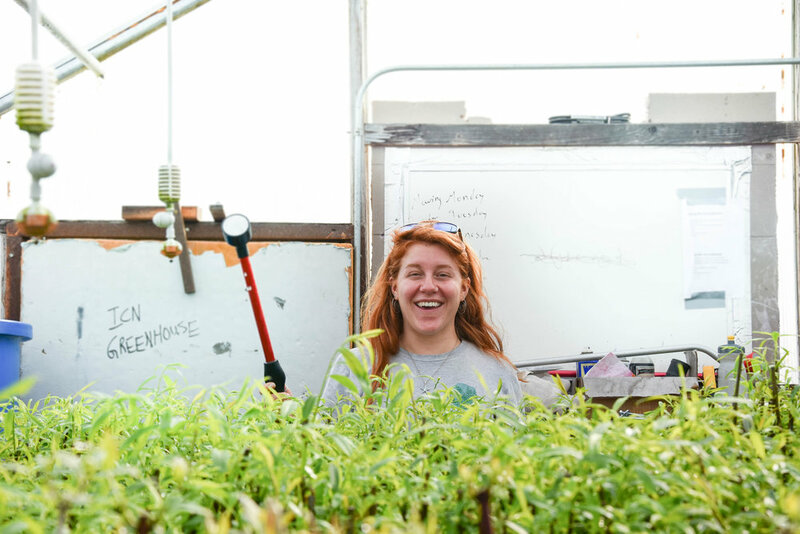 Last year, Mandy returned to the Intervale Center as a Field Technician. I chatted with her about planting trees and how her work fits in with her life philosophy. How did your interest in sustainable agriculture begin? I first became interested specifically in this field when I was a Rubenstein school student at UVM. I found the Intervale Conservation Nursery through a work-study opportunity. It was right after I had gotten back from living in the Findhorn ecovillage in Scotland where I was on the parks crew. I also helped maintaining, reorganizing, and designing a perennial herb garden. So for the first time, I got experience maintaining and working with the landscape and plants. That community in Scotland was also just oriented around plants and what it means to work with them, not against them, and to listen to them. So when I got back to Vermont and I was looking for a new work-study, I saw this as an opportunity to keep doing this newfound love of mine to work outside and be outside and work with plants. At that point, I was down here for almost two years every Friday. So you worked for various companies and taught in between your ICN internship and right now. Did you always think you would come back to Burlington and the Intervale Center? I definitely stayed in touch and any time that I was a free agent, I would get in touch with Mike and ask him about the planting crew and see if there was an opportunity for me to come and work on it. A couple times I did that and then I would make other arrangements and do something else but then last year, I came to visit in February. I heard that there was a field tech position opening and I didn’t have a job then. Mike laid out this five-year plan for the nursery and let me know that Seth, the previous assistant manager for the Nursery, was going to be leaving. That was really bittersweet because I was happy for him but sad that I wasn’t going to have him around as a mentor. But Mike kind of just sold me. He said, “If you were ever going to come back to the Nursery, now is the time.” And I was like “Alright, here I come!” So I went back to California, packed up all my stuff, and moved back to Vermont. During my time away from the Nursery, I wasn’t doing tactile things. I realized that pouring my time, my heart energy, and my love into the tapping of a keyboard wasn’t really working for me. Besides working with your hands, do you have any more reflections about the different aspects of working at the Nursery? Yeah, I think a lot about where we’re at as a community at a local, regional, and national scale when it comes to land use. I think that’s my new learning curve right now, learning about land use and respect for the land and this balance that has been lacking for a really long time, and also learning about social enterprise and the style that we’re doing it in, how the Nursery relates to this larger non-profit. I didn’t take business classes in college and it’s something that I’ve always wanted to understand more about. I feel like I’m good at customer service and I’m good at sales. And if I want to learn about business, why not have it be in the business of selling trees? Planting a tree in one place, you’re not going to see immediate benefits in 3-5 years; you really need to wait decades. It’s nice to be part of a community that’s recognizing this shift: if we’re going to participate on this planet in a healthy way, we need to start thinking long-term and be a piece of this long story, instead of the “my life is the story” mentality. Planting trees is definitely something that’s part of that story. Can you give me fun tree fact? Or tree anecdote? I’m also crazy appreciate of Hemlocks. They are crazy cool because their way of outcompeting other species is that their needles are way more acidic and when they fall to the ground, they kill everything. So you know you’re in a Hemlock row when you get to a forest and there’s literally only Hemlock.